Live performance of "The Ballad of Billy The Kid" from The Midnight Special (1975). That is Doug Stegmeyer on bass, wearing the red shirt. I believe that is Rhys Clark on drums too. Rhys was with Billy's band in the early 1970's. Download "The Ballad of Billy The Kid"
Billy continues the country-and-western theme with the mini-epic "The Ballad of Billy The Kid." It is a brilliant tune on many levels, an Elmer Bernstein and Copeland Brothers-esque tribute to a fictionalized Billy The Kid. It rocks, it rolls, it clicks and clacks along to horse hoofs, and it even features symphonic strings. The call-and-response between the bold strings and Billy's nifty piano playing is utterly enjoyable. It's big, it's bold, it's brassy. It's quintessentially American. Like America, the scope of the song is grand and sweeping, but at the same time the song tells the intimate tale of a loner, a man who always rode alone yet won the admiration of many. A man who "never had sweetheart" or a home, "but the cowboy and the rancher knew his name." In the final stanza of the song, Billy brings us back to the 20th century and another "Billy," this one from Oyster Bay, Long Island who carries a six-pack in his hand instead of Colt 45 and who also aspires to be famous. Billy has said he was not referring to himself in the final stanza, but certainly his story fits the theme. Like the young Billy the Kid, Billy Joel "soon put many older guns to shame" and established himself "east and west of the Rio Grande." Billy discusses "The Ballad of Billy The Kid" on SiriusXM radio. There are several good live versions of the song such as the 1981 version (external link) on Songs In The Attic. In concert, Billy often humorously explains how the song is historically inaccurate (though Billy is an avid history buff and knows his history). For example, he sings of Billy the Kid's legend spreading "east and west of the Rio Grande," however, the Rio Grande runs east-west. Studio version of "The Ballad of Billy The Kid" set to photos. 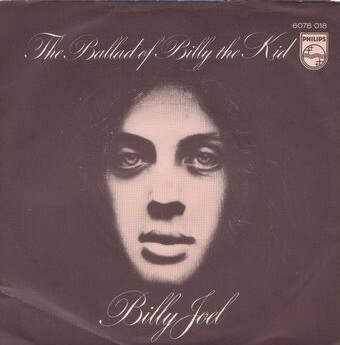 "The Ballad of Billy The Kid" © 1973 Sony Music. Billy talks about "The Ballad of Billy The Kid" in a 1977 interview.